I have two posts today. 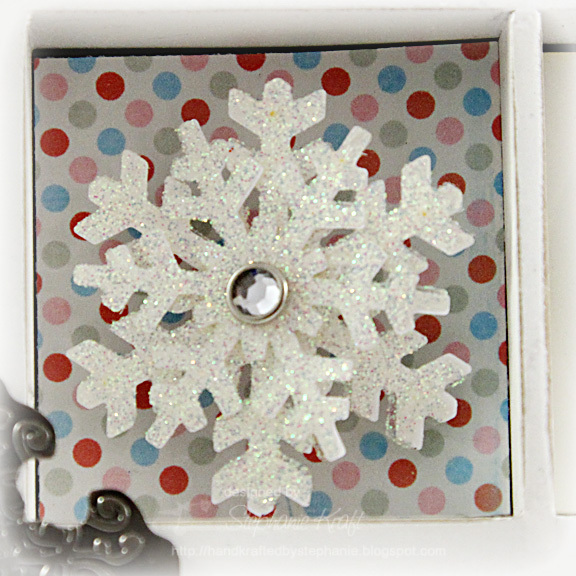 If you are looking for my Sparkle Creations Challenge card, please scroll down or click HERE. Thank you!! Hello! Welcome to the final day of MFT Teasers! 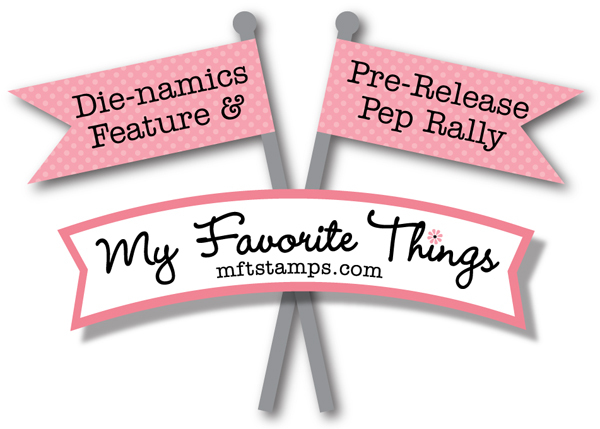 Today it is time for the Die-namics Feature and Pre-Release Pep Rally! Today, the incredible DT and Guest Design Team are featuring the new Die-namics and sets that we have teased you with for the past week! For a complete list of designers, please visit Kim's blog, HERE. 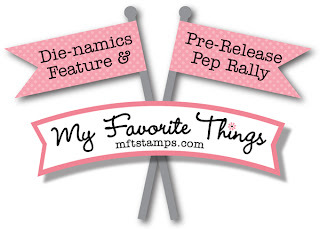 I hope you will join us tonight, Tuesday, 12/6 from 8-10 PM EST in the MFT Forum for our December Release Party! I hope to "see" you there! I had this idea to make a perpetual calendar for awhile now, but I knew that I wanted to make it unique. 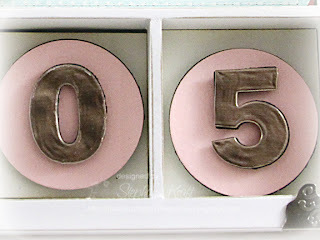 After a few nights of waking up and dreaming of how to do it, I came up with a magnetic calendar that is housed in a 7Gypsies 6" x 6" shadow box. I have some photos of December and January to show you, then I will explain in more detail how I put it all together. When you are viewing these photos, please keep in mind that each section is magnetic, so everything can be changed at any time. For December, I used the new Pure Innocence - Holly Girl. 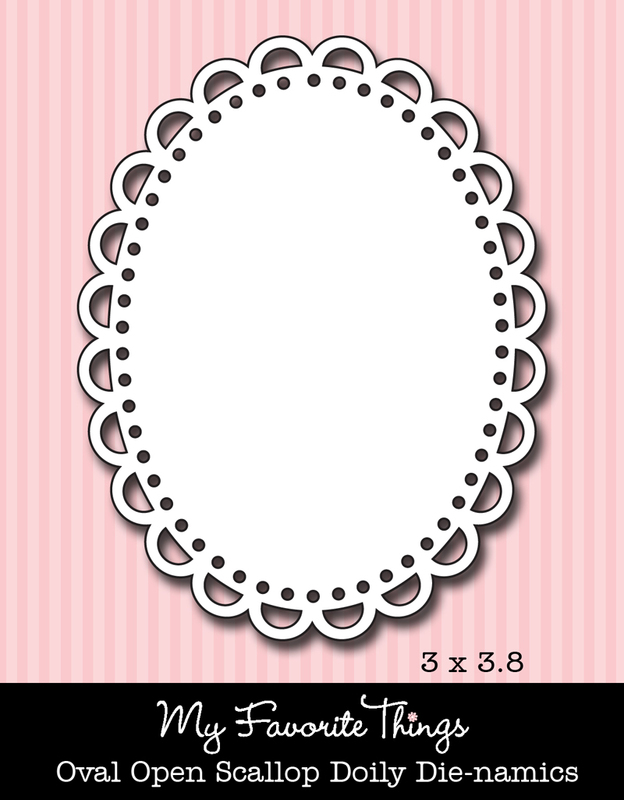 I stamped, colored and pieced her, then cut the image panel out into an oval and added some soft sponging around her. 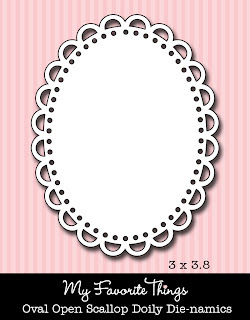 I layered her over the new Die-namics Oval Open Scallop Doily. I stamped the month (also from PI - Holly Girl) and used the Die-namics First Place Award Ribbon Die to cut it out. I also added some stitching before adhering it to my magnetic sheet. There is another magnetic sheet inside the box which allows it to fit into the tray and not fall out. The layout is just under 4" x 6" and completely pulls out of the shadow box by pulling up on the metal tab brad embellishment. I have to credit my DH for that idea. When I was trying to figure out what to use to pry up my layout, he first suggested ribbon, then he said an L-bracket, which made my laugh, but also reminded me that I had these metal brads with a little loop on them. I really wanted to add the metal corners to the frame, and at first I was afraid they would hinder getting the layout out each month, but it is no problem maneuvering around them! The other 2 openings are for the date. 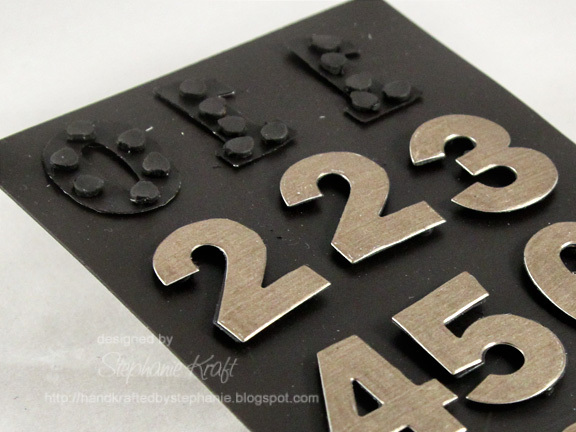 Again, the squares are magnet and so are the circles (die cut using the Die-namics First Place Award Ribbon Die) and numbers (die cut in foil using the Die-namics By the Numbers). This way I can mix and match whenever I want to change the background. You'll notice that I kept the same layout, but this time I used Pure Innocence - Skater Girl. I kept the pink circles under my 0 and 1 since it also went with the patterned paper, but I intend to make more circle magnets with other colors. 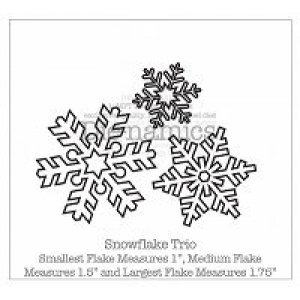 I switched out my poinsettia for a sparkly layered snowflake which I made using the Die-namics Let it Snowflake Dies. "January" is from Pure Innocence - Carnation. I only had time to finish December and January, but I can't wait to make more little embellishments for the lower opening and also make layouts for the rest of the months. I will share them as I make them! If you're still with me and are interested in a little more "how-to", I have a few photos to show you. 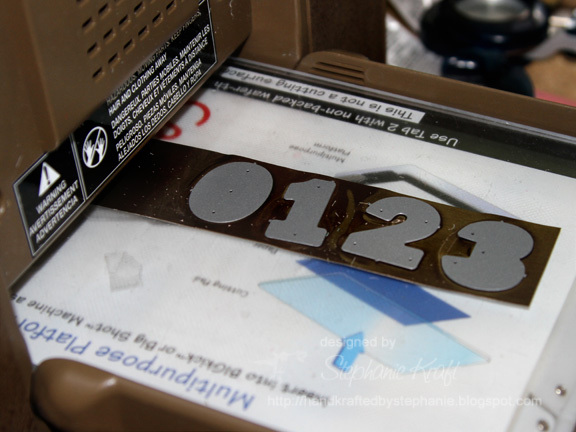 To make my numbers, I used my Vagabond to die cut the numbers first on the foil. Since the magnetic sheets that I used for the numbers were a little thin, I punched small circles (with my Cropadile) out of thicker magnetic sheets and adhered them to the back of each number with a micro glue dot (they already had adhesive, but I wanted to make sure that they don't fall off). This adds some dimension so that my numbers are popped up a little AND more importantly, adds strength so that it sticks to the circle magnet behind it. 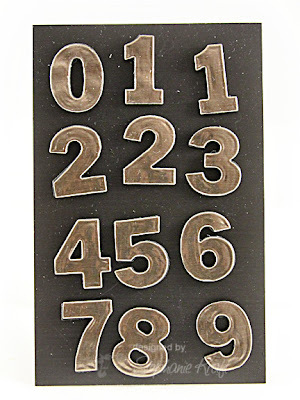 You can see the magnetic reinforcement on the backside of the 0 and two 1s below. 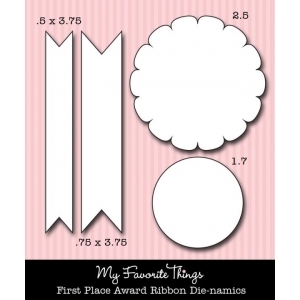 Accessories: Die-namics Oval Open Scallop Doily, Die-namics Fringed Perennial, Die-namics First Place Award Ribbon Die, Die-namics By the Numbers, Die-namics Let it Snowflake Dies (MFT); Oval Nestabilities (Spellbinders), Corner Rounder (WRMK), Markers (Copic), Shadowbox tray (7Gypsies), Metal corners (Tim Holtz), Crystals (Prima), Crystal brad, Metal brads with hook (CTMH), Glitter, Magnet sheets, Boosters, Thread, Sewing machine. What an awesome post! Thanks for all the details and instructions...and for the great projects to look at! Have a fab day! Wow, Stephanie! I just LOVE your project! It is such a cute idea! 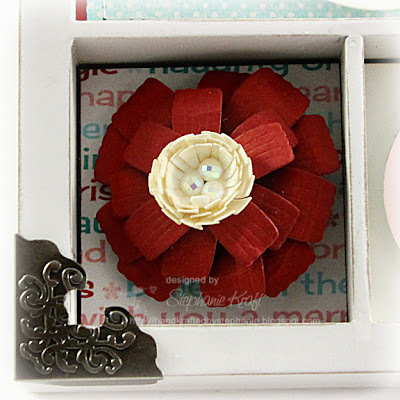 LOVE your shadow boxes!!! What a great idea! THanks for sharing all these details! These are so beautifully done. 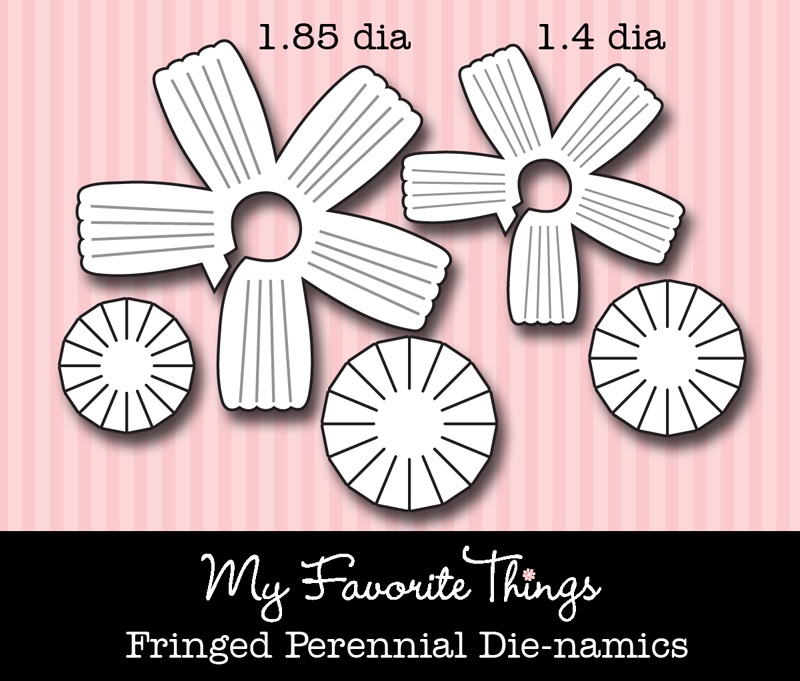 I just love the flower dies they are great!!!! i will have to wait and see if i get any xmas money!!! love this project - it's something you'll get to enjoy all year, and can keep creating more elements to make it last forever and ever! Oh, I love it Steph! I am seriously in LOVE!!! :) What an amazing calendar! Wonderful idea!!!!! 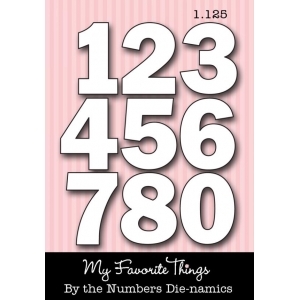 And I am so glad you showed the numbers in detail, because I was wondering what cool stuff they were made of! What a clever combination of sets & products!!! :) They make for a great card! 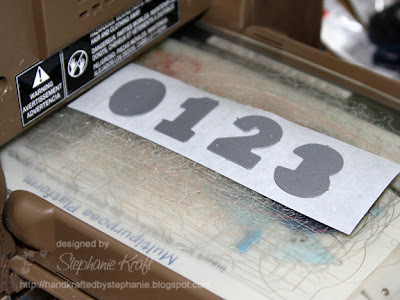 What a fabulous idea...love this project, thanks for sharing!! Stephanie, this is GORGEOUS and BRILLIANT!!! Love this idea! Thanks for sharing the process! Stephanie, this is fantastic!!! Love it! I have to find one of these shadow boxes now :). Thanks for all the wonderful inspiration! Wow! What a beautiful calendar project. Well, even though you probably lost a lot of sleep over this project, it is just amazing. Thanks for telling us how you made it. oh, wow! this is fantastic and soooo sweet! THAT flower, rocks!!!! 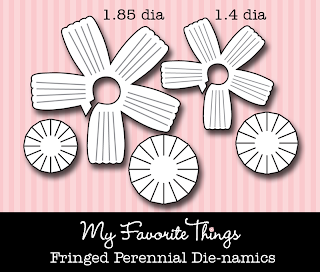 looove what you did with those beautiful die-namics. What a beautiful project! This was so worth seeing. Thanks! Oh my goodness Stephanie! THIS is ADORABLE! I NEED to CASE this! I love all the MFT goodness you showcased here! What a perfect calendar and treasured keepsake! Thanks for the inspiration! Awesome project, Stephanie! Love all your detailed pictures! Thanks for sharing! oh my goodness, how fun is this! totally love this idea! This is the best idea I've seen all week! I have *got* to make one of these for myself! I'm giddy!! wonderful calendar, so many elelments and thanks for sharing the details, awesome work. This is AMAZING Stephanie!! LOVE IT!!! So clever!! LOVE your perpetual calendar!!! The numbers are so cool!!! Fantastic idea! WOW! I want to make ones of these now! LOVE it!!! NO WAY! THis is simply AMAZING Steph!! WOW! I MUST make one of these for my little one!!! LOVE!